Come and see if you need a discount. Baofeng 1.25-meter Band. TYT QYT Leixen Car Radio. & DMR Car Radio. About Xiegu G90 Detachable Display Unit The display unit and the host can be separated, which allows you to flexibly arrange the position of the host. Wide Range Auto Antenna Tuner There is a built-in high-powered automatic antenna tuner that can help you to set up and debug antenna quickly, antenna would no longer be a pain point for amateur users. Clear Screen Shows All the information is clear at a glance on the display. With the ±24k bandwidth real-time spectrum display and special waterfall display, various signal conditions are under control. Easy to Use You can use the Quick Mode button to turn on or off various functions. Instead of setting up different functions in the menu, you can directly adjust them by pressing corresponding function keys. Please do not take this radio apart by yourself, as any mini change may influence the performance. Please kindly note that Xiegu manufactory and our store will not accept any artificial damage of this. 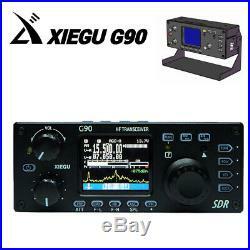 Description As the first model of the Xiegu G-series, G90 is a portable 20W HF amateur radio transceiver. With SDR architecture and built-in auto antenna tuner, G90 has excellent transmit and receive performance, which brings user a highly configurable and functional experience. The G90 has a separate display that can be separated from the host unit and connected via a VGA cable. ? Detachable Display Unit: The detachable display design allows you to flexibly arrange the position of the host radio. ? Chromatic Display Shows: ±24k bandwidth spectrum chromatic display and waterfall display. All the status of functions can be clearly showed in the corresponding area on the screen. ? Convenient Side Interface: G90 uses 3.5mm stereo jack (3-pin) for connecting headphones. You can update firmware for the machine-head (controller) or other features. ? Rapid Functional Mic: Directly press the “TUNER CALL” button on the mic to turn on the built-in automatic antenna tuner for tuning. The way of work. 0.5 MHz-30 MHz. 10.5-16.5 V DC. All amateur bands in the range of 1.8 to 29.999 MHz. 0 ° C-55 ° C. ± 10 ppm for 10 to 60 minutes after lighting. Size of the machine. 120 45 210mm (without protrusions, state of the combination of the Central Unit). G90 recommended accessories (not included in the package) CE-19 ACC Expansion Adapter for easy PC connection XPA125B 100W Power Amplifier with built-in antenna adjuster. GSOC specialized dedicated large screen controller of G90. If you have the following issues, please. To get your problems solved. Item Not As Description. I Need to Return My Item. Customer’s satisfaction is our goal. (No such issues for USA). If your item is not as described or faulty when you receive it please contact our CS to get your problem solved. If you are satisfied with our service, pls. Please leave feedback if you are satisfied. Thanks in advance for your patience! The item “Xiegu G90 HF transceiver 20W SSB/CWithAM/FM 0.5-30MHz SDR Radio with Antenna tuner” is in sale since Tuesday, March 19, 2019. This item is in the category “Consumer Electronics\Radio Communication\Ham, Amateur Radio\Ham Radio Transceivers”. The seller is “radioddity” and is located in HK. This item can be shipped worldwide.